Whether you’re a marketer in a larger business, or a business owner in a business that hopes to be – the pressure to constantly keep on top of emerging digital trends can be huge. You could probably add something new to your to-do list hourly if you were to plug in to all the blogs, vlogs, webinars, etc. available on the topic. What’s more, when the latest digital technique is sold as alchemy, it’s tempting to follow the gold rush! So, here’s my quick run down of things I believe about digital marketing, that I truly hope come as a relief. Nothing much has changed in the brains of your buyers since the advent of email, social media and the ever-connected world. Evolution simply doesn’t move that fast. Whilst I fully accept that there are genuine concerns about attention spans and the screen-time effect on young brains – at its core, decision-making is unchanged. Buying decisions have particular psychological boxes to tick. Whilst the reference groups are most definitely vaster, and the information available faster, the brain will still follow the path it needs to in order to come to a decision. What this means for your marketing is that it’s more important to understand how and why your ideal buyers make their decisions than it is to obsess over understanding every new digital fad. Where does digital sit in their buying decision? The devices they use, including operating systems and browsers. You need this as it affects how your materials look to them. The formats they prefer to digest information they’re looking for. Are they someone who looks to video resources, or are they a print it out and read it later type of person? The context in which they access digital resources. Are they at their desk, in a noisy cafe, on the bus or sitting on the sofa with a glass of wine? This will change how they interact with your resources, and the type of things that will appeal. The schedule they work within. Do they research your topic before work, at work, in the evenings, etc? This is critical to making confident decisions about when to release your materials. The platforms they hang out on. By which I mean, are they hanging out on Facebook, Twitter, LinkedIn, etc? There really is no point being somewhere they are not. The hashtags and Influencers they follow. This is not about who you are interested in, it’s who and what they are interested in that matters. The content that they find interesting and relevant. Following the scent of who and what they already follow and consume will give you good clues to what you might need to create. 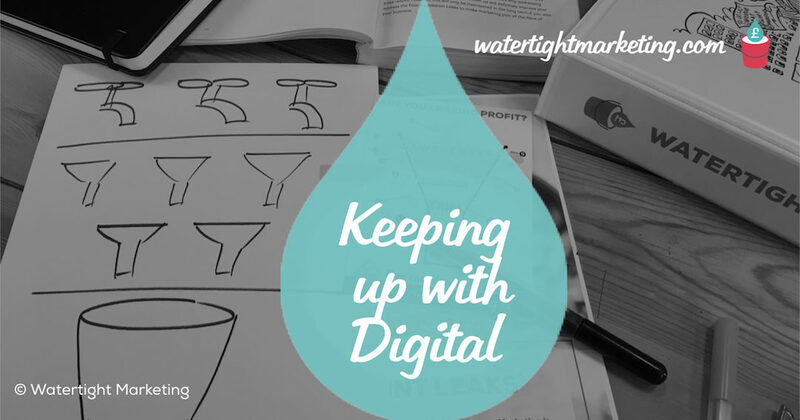 The Watertight Marketing methodology is focused on choosing the right tools for each step of a buying journey, by understanding the task they need to fulfil – which essentially means what psychological box does this need to tick? Awareness: An update on LinkedIn each day. Interest: A new blog post each week or each month. Evaluation: A webinar that acts as a showcase for what you do. Trial: An online quiz or audit that helps them assess the value of what you do. Adoption: A welcome workflow that delivers a sequence of comms that brings people warmly into their relationship with you. Loyalty: A Facebook Group for your customers where you answer questions and give real value. Our clients have seen the best results when they’ve made confident decisions about focusing down on a few key techniques and mastering those before innovating further. This is like fitness folks, start with a manageable routine – get good – then step it up. NEED AN EXTRA PAIR OF HANDS TO GET IT ALL DONE? We can find, train and support a member of your team through to a productive and qualified Level 3 Digital Marketer for your growing business.